Mythology has been a key tool throughout the development of psychology and is often used to help describe and digest some of the more complex ideas that are presented. One of the most well known of these is the myth of Oedipus, a narrative developed by Freud to help explain some of the ideas that he happened upon. Though the theory itself is often discredited in modern psychology, it is a great example of how mythology and story can be transcripts of the unconscious mind. In this case the archetypal mythology of ‘the monster/ dragon fight’, is more applicable. There are many examples of the use of mythology to communicate underlying psychology throughout literature from the ancient mythology described by the Greeks, with Zeus (the all father) and Aphrodite (love) etc. and throughout modern literature, a good example being, comic books with the joker (chaos or disorder, the trickster) and the batman (law and order, structure). The interactions of these characters or ‘archetypes’ (an idea we shall explore future later on), form the basis of most mythology and in fact most stories. It must be considered that when the ancients shared myths they were usually thought to be true stories or of a historical or prophetic nature, and served the societal role of binding groups of people together or ‘justifying’ the existence of populations on something above themselves. They formed the heart of communities and provided histories and roles in life that people could aspire to. This is just one of the things that modern mythos plays on today. Some Greek myths, for instance Homer’s Troy, where based on what was once thought completely fictional events which have become reframed upon the finding of the ancient city of Troy. Modern mythos may reflect this in that they are based on fictional realities but upon future investigation it may turn out that they are analogous of the authors personal psychology or surrounding psycho-geography and their relationship with it. As is considered with other more main stream writing styles where the works of some authors are seen as reflections of the events and views held by people of the authors time and location. Many people consider ancient myths to still be relevant to today’s society due to their ability to teach one of moral values and of qualities of the world around them. This may be similarly said of modern mythos and literature but now it may be better to consider them analogous of the world that was present in which the author lived. Though many of these lessons may still be pertinent as many Archetypes persist through the ages of humanity, i.e. love, hate, good and evil. Moreover they may be reflections of the psychology of the writer through the use of symbolic interactions and wording, (to further explore this please look at object relations theory). There are several examples of how important ancient mythology was to the development of the modern world and society, from the re-appropriation of the word Olympic for the Olympic games through the word panic, meaning Chaos or Pandemonium, originating from the Greek god of the woods and fields and his actions therein (a notable theme in Lovecraft’s short story Dagon), to the modern description of herculean feats another re-appropriation of the name of an archetypal character from a myth about taking on impossible tasks. In fact many of the constructs of the modern world view and of the psychological structure are directly influenced by myth. It could be said that the stories and myths that are created by modern writers are indirect products of ancient mythology and psychology as well as the way we view the world now. This may point at the underlying psychological structure of humanity that almost all ‘mythological’ literature seems to be attempting to divulge or explore. Neil Gaiman’s ‘American Gods’, is a fantastic example of the incorporation of the mythological view of the world being incorporated into the modern world, utilising Gods of highways, television, credit cards and corporations to help develop the story. Though not very Lovecraftian it is an excellent example of modern mythology and its present relevance. Freud first posited that the mind is essentially composed of the conscious and unconscious and that our aware selves basically consist of our conscious mind and our unconscious mind functions mainly as a rubbish bin. When thought left in the unconscious is not processed correctly, for instance repressed trauma, then it ‘ferments’ and begins manifesting in the conscious mind – he, called this phenomenon neurosis. Whereas another later psychologist Carl Jung suggests that the mind is more complex than this. Jung describes the mind as consisting of the conscious, unconscious and collective unconscious. He believed that we were all parts of the mind but that the conscious mind was used for processing logic and reason, where as the personal unconscious digested all of the unsayable and incommunicable thoughts. That much more complex ideas, for instance the thoughts one has of the death of their parents, the pain juxtaposed with the relief of them having been released from their own pain, whilst feeling happiness and jealously, as well as the apparent presentation of your own mortality in the face of the fulfilling of theirs, feelings that you are not meant to have and will never really understand. Jung did not believe that Freud was that far off using story and mythos to help people understand the unconscious but that he was wrong in using the Oedipus myth so broadly, that in fact this mythos was personal to Freud, his own Archetype, and that everyone had their own Archetypes and utilised their own personal mythos. Later psychologists elucidate to the concept that these personal myths could be viewed as cognitive structures and schemas, further exploring the relationship between mythology and psychology, as David Feinstein explains that whilst considering the relationship of cultural mythology to personal mythology an understanding of personal mythology can be used to “enhancing individuals’ control over their lives.” (http://psycnet.apa.org/journals/ort/49/2/198/). Archetypes are, according to Jung, the ‘universal symbols that form the basic understanding of human existence'(C.G. Jung, The Archetypes and the Collective Unconscious, 1996). Jung believed that, much like there are only so many different stories you can write before they become variations of themselves, there are only so many roles in life for people to play and these can be considered archetypes of the unconscious. These archetypes and variations formed by combinations of them, can be considered the symbols understood by the unconscious. He believes that the unconscious and emotions can only truly be communicated in symbols due to the nature of their complexity. Also, that rituals and practices help us process and digest the complex ideas within our subconscious, allowing one to organise the unconscious and better effect ourselves in life. “My thesis then, is as follows: in addition to our immediate consciousness, which is of a thoroughly personal nature and which we believe to be the only empirical psyche (even if we tack on the personal unconscious as an appendix), there exists a second psychic system of a collective, universal, and impersonal nature which is identical in all individuals. This collective unconscious does not develop individually but is inherited. It consists of pre-existent forms, the archetypes, which can only become conscious secondarily and which give definite form to certain psychic contents.” (C.G. Jung, The Archetypes and the Collective Unconscious, 1996, p. 43). It is from here that many of the ideas that are pervasive in society may stem and from the discrepancy between ones perception of one’s self and the societal structure of these Archetypes that may be responsible for the psychology that creates the dissociation from self and society that affords what we see in H. P. Lovecraft’s work. There are many persistent archetypes that he uses throughout his writing, for instance the use of the ‘dragon’ Archetype from myth occurs regularly, which is alluded to in Dagon and directly addressed in the Cthulu mythos. The dragon and other Archetypes that Lovecraft utilise serve to vividly develop his writing and lace all them with common themes. 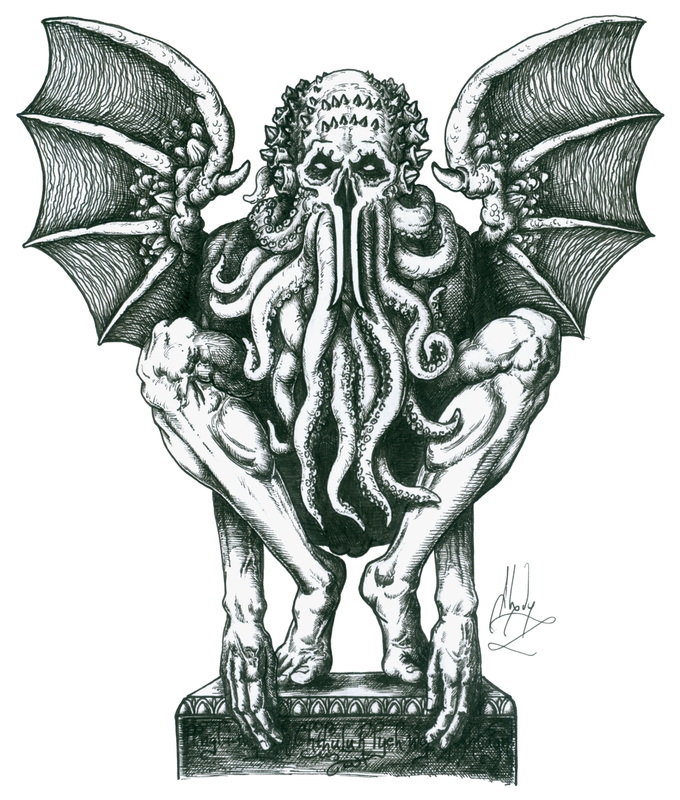 Furthermore, the use of these Archetypes facilitates the development of the Cthulu mythos that we associate with his work, linking them together with similar underlying themes. These Archetypes can also be seen in many Lovecraftian works which include at least one, and more often than not several of the Archetypes he employed. In particular, it seems that the interaction of antipodal Archetypes in a deconstructive manner resulting in unbearable cognitive dissonance is what characterises Lovecraftian works. These stories almost always lead to deconstruction of commonly held ideas and preconceptions of self or other as the stories move forward, leaving the reader with the feeling of the absence or loss of something, further adding to the depravity and indescribably awe-inspiring terror that his works are inscribed with. The use of these common themes throughout Lovecraft’s works suggest a lot about his own psyche and the times that he grew up in and gives us a window to the world he inhabited and his own personal mythos, as Jung described. It also gives a lot of information about the personal psyche of his fans and why we are all drawn to his works and style of writing. Though we all have our own ways of dealing with and looking at the world there is an arrangement or configuration of the archetypes of our collective unconscious that we are all drawn to. It is this that makes Lovecraft’s works so pertinent for a few but particular group of people and that best describes the link between his fans and the emergent development of his mythology in modern literature.